Waitiri Creek Winery and Restaurant sits amongst rows of wine grapes nestled in the Central Otago wine region in southern New Zealand. 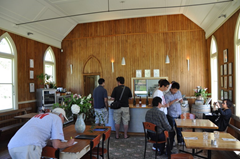 The cellar door/tasting room is actually housed in an old church which was relocated to the property. It also houses a tiny restaurant, with additional seating outdoors. There are sprawling green lawns with toys to keep the kids happy while the adults sample some of the region’s bounty. 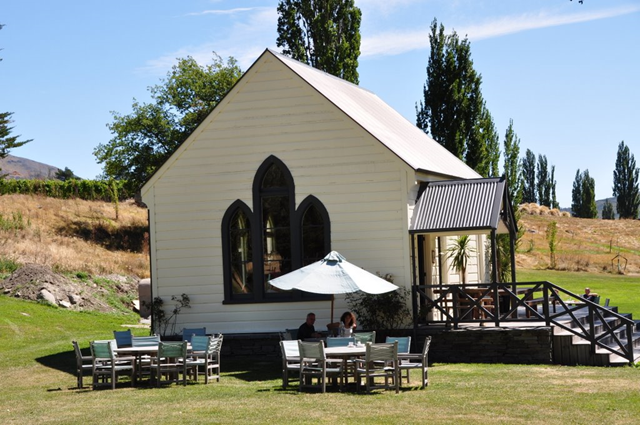 Central Otago's Waitiri Creek Winery and Restaurant's Cellar Door/Tasting Room is housed in an old church. 2008 Pinot Gris – Very nice! Would make a lovely summer wine. 2008 Chardonnay – Didn’t finish cleanly, not fruity enough for our taste. Pinot Noir Rose – Again, this wasn’t fruity enough for our taste. Just there. Nothing special. 2006 Pinot Noir – 10 months in the barrel didn’t help this wine develop the complexity we’d like to see. It also wasn’t fruity enough for us. 2007 Pinot Noir – Actually had more complexity than the 2006 Pinot. Unfortunately the finish hadn’t mellowed out enough for us.